I just can't resist him anymore, he's far too cute. 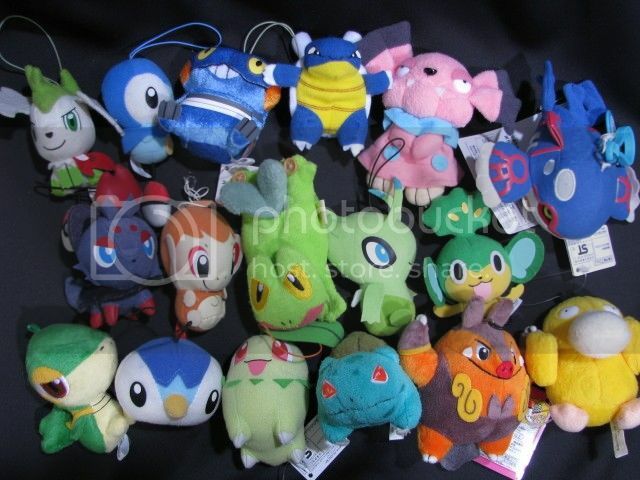 For now, I'm mostly wanting any plush; I believe there are a few and I'd love the canvas plush the most. The nugget has captured my heart!~ I'm also looking for any charms/stamps/figures/straps. Flats aren't really my concern since this will be added to my side collection. I'm not sure on the prices but I'm willing to work with most prices. Again, the plushes are my main focus and anything where the little nugget is sleeping. And of course it goes without saying that I'm wanting Persian, Chingling/Chimecho, Whimsicott/Cottonee, and Audino items~ Again, I don't particularly want flats at this time unless it's magnets or something similar. hey guys, so I decided that I want to get in on a little eevee action so selling off a couple of things! including some Mew items and a Serperior plush. All sales are haggle friendly please just be reasonable! Items are behind the cut! They are made of a soft plastic and the feel like there is a piece of foam inside of them. They are flat but slightly poofy. The date on them is 2005. The Jynx is for my collection but Deoxys will be sold in my upcoming sales post. If posts like this are not permitted or my pictures are too large I will take it down, please just tell me! Hi my name is John and I just realized I have been on this community for more than a year and I've never posted anything, so here is my intro and part of my collection. new years mini dolls set! tired of mini pokedolls? i'm not! just some tiny news from our friend peka. 2013's new year's day item is a 12 mini doll set inside a pokemon center house! it is 5000 yen. i'll try to get some sets for you guys :) i sense many GBs! Just popping in with a quick little wants post. Thanks guys, you're all wonderful. I've been lurking around the community for quite a while, but I haven't introduced myself officially yet so here we go! 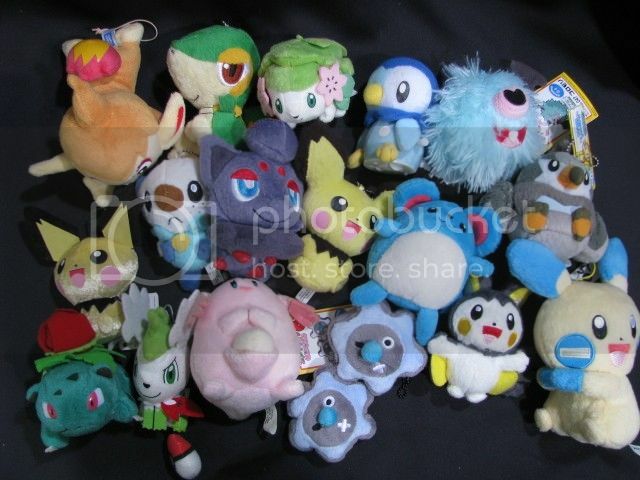 Just like a lot of people here, I was big into pokemon in the 90s, when pokemon hit hard all over the world, and was somewhat separated from pokemon until a few years ago, when I saw a very very cute shaymin plush(not pictured) from a local anime convention. 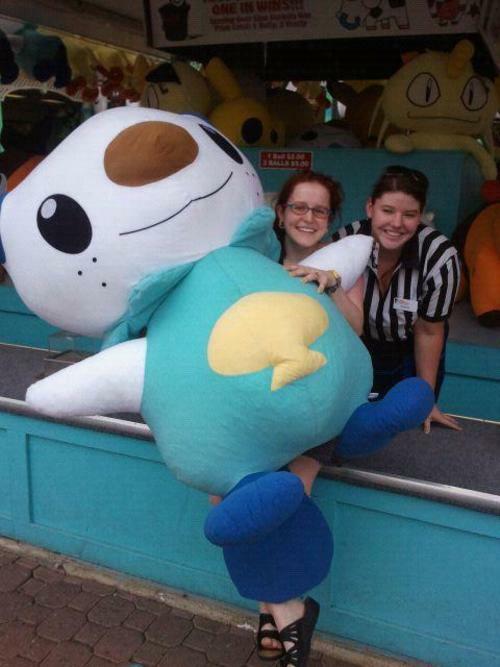 Of course I bought the plush, and it totally fired up my plush collecting spirit, and I just went around gathering up pokemon plushes from everywhere. I eventually arrived at this community and has been a member since. 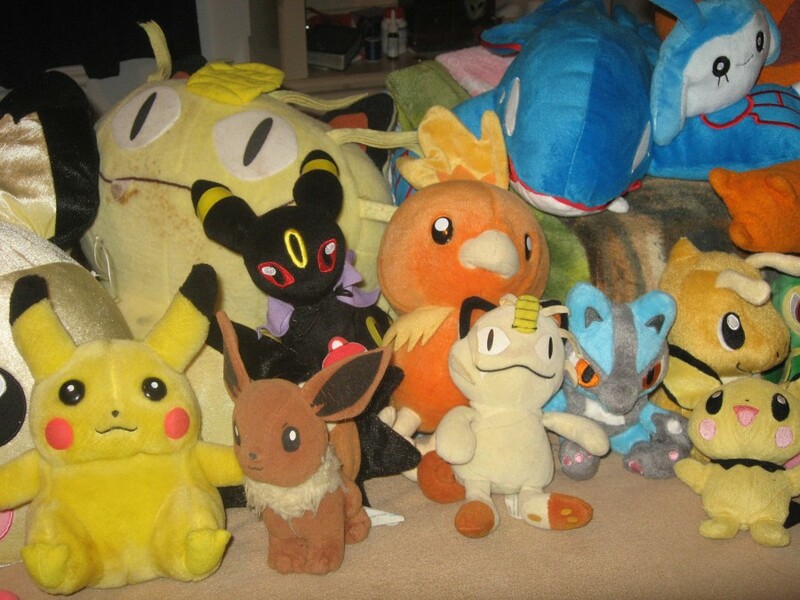 Just an FYI, I not only collect pkmn plushes(although it is my main passion), but I collect various animal plushes(cats, alpacas, dolphins, snakes etc) or other anime related plushes as well. 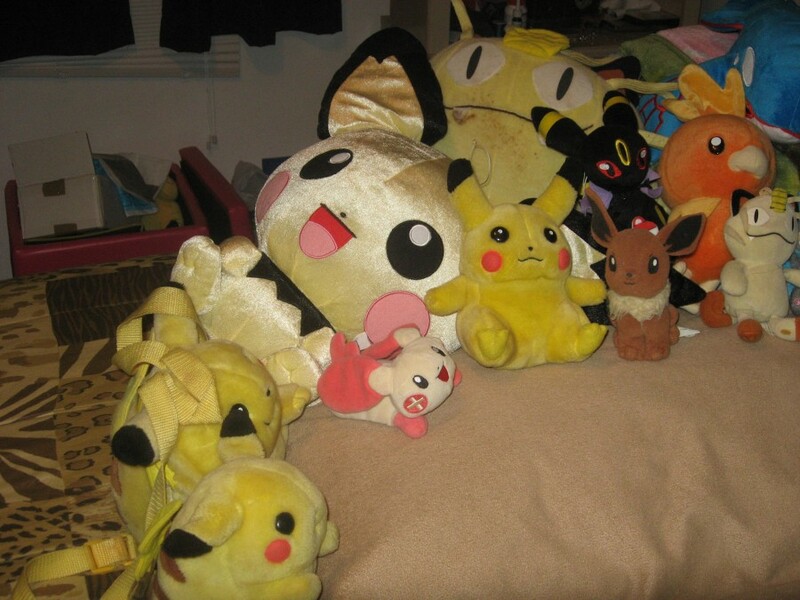 People freak out when they see my collection...It looks like a jungle in here XD I've never been ashamed of my plush collection though! 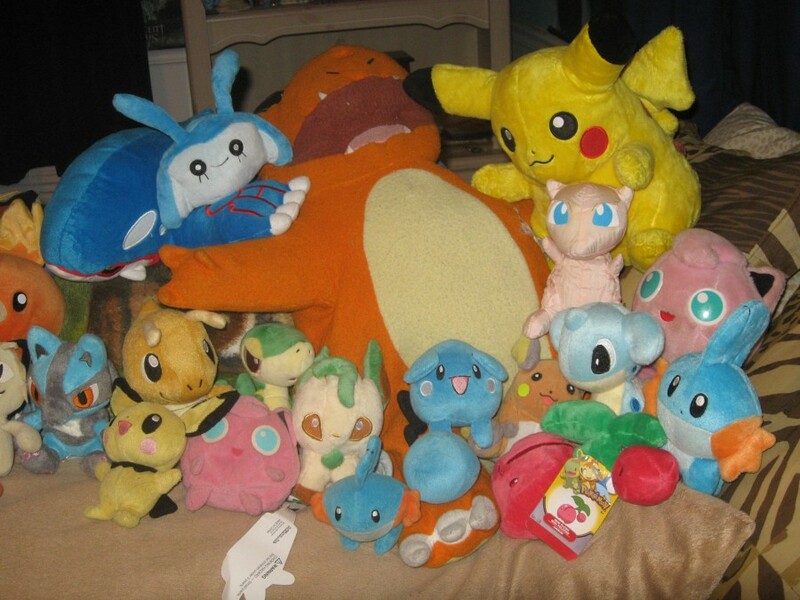 I might do a collection update soon since I have more plush arriving around Thanksgiving, so stay tuned and thanks for reading this post! 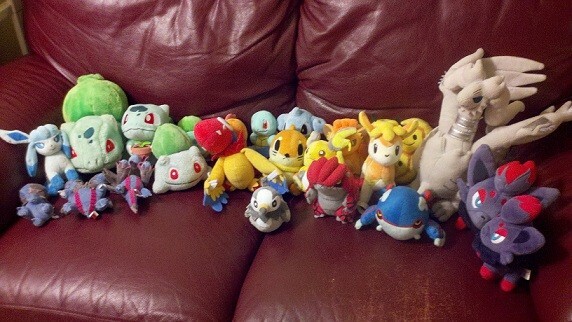 Plush Collection Post! And wants! I'm also an avid Pokemon TCG collector, and my goal is to get a card of every pokemon. So far I have completed the sixth gen and almost the first. How do you display your collections? Do you buy shelves SPECIFICALLY for your precious bundles? I also think I have FINALLY decided what I want to focus on collecting the most, and those are Vaporeon (mostly shiny) and maybe Eevee too. :) I also love dragonite, but gosh there just isn't much of him. ;-; Ah well. I am looking for the sleepy eevee pillow, as I believe a friend would adore it for christmas, and I'd love to get one for myself down the road. xD I can't find them on ebay though, any thoughts where I can snag one? Update + New Manta Rays gets! 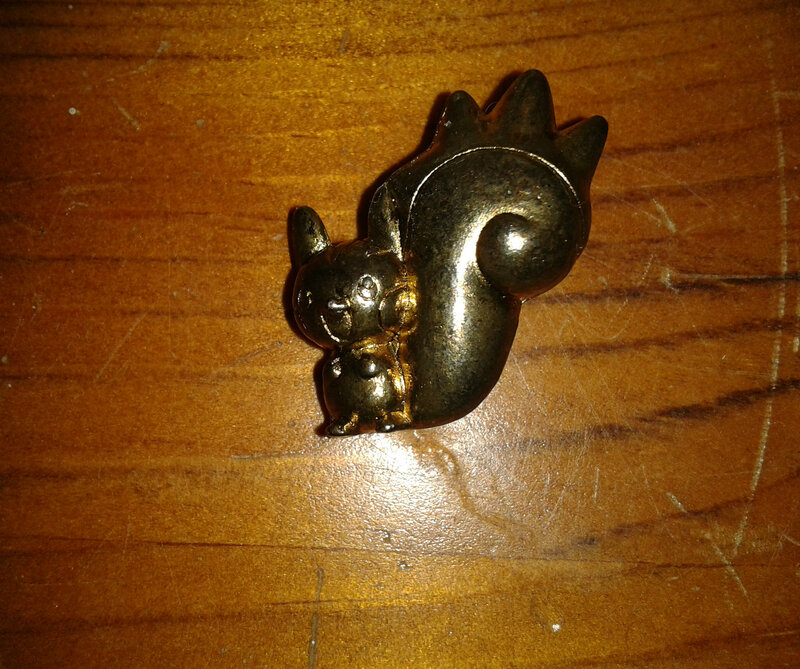 Second, my hands are just shaking from excitement (so crappy pictures with evening ahead), because I cannot wait any longer to show you guys what new gets I have gotten myself (not only Mantyke/Mantine)! A small teaser for you! 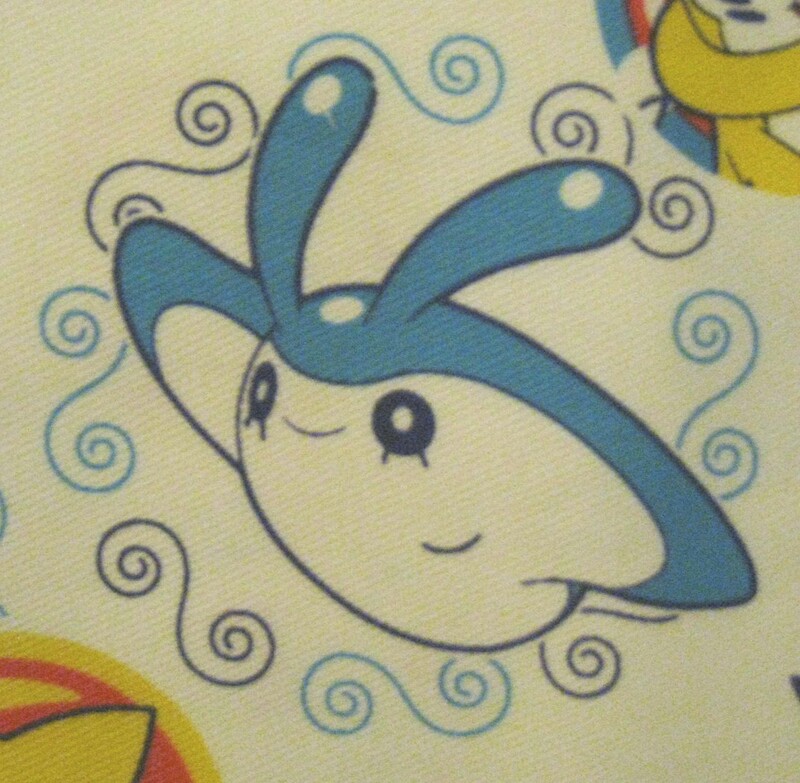 Hey guys just a reminder that my auction for Parichisu ends tomorrow at 9pm UK time http://pkmncollectors.livejournal.com/13575300.html It's still at its starting price at $5. What do you think of my espeon? What do you think of my trial custom espeon cushion?! I made it out of felt and made espeon by memory, I didn't copy anything. I may make more to show you but I would like to hear what you think about it first. The pokemon card is a comparison to show the size of the cushion. With all the new stuff I got, that means I edited my collection site! Just a quick little reminder that the Group Buy for these lots is still going on! We are SO close to claiming everything and being able to buy the lot, so if you see anything you want, please help out! 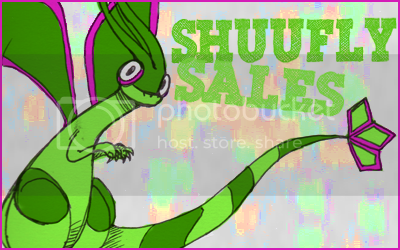 <33 You can go to the page by clicking either image! Hi guy I am back after about 3 months I slowed down my pokemon collection for my other hobbys plus got a new job I came and had a look round here once every so often but not posting, I have been collecting pokemon cards for my Nintendo E-Reader from the E sets (Expedition,Aquapolis and Skyridge) and I got them all (well all the ones with long dotcodes on them) there are some very cool minigames to play by scaning the cards here are my two favs. like this one Jumping Doduo;Here Doduo is jumping over Bulbasaur the aim of the game is to jump over as many pokemon as you can. If you want to see your fav pokemon in 8-Bit ask and ill put a link in a reply. 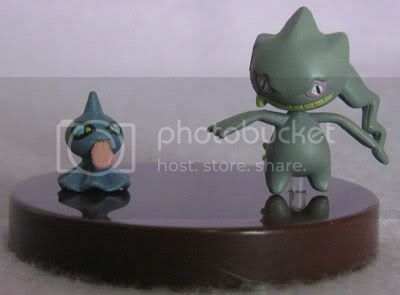 Only one want the Banette line Zukan the last Zukan I need to complete my ghost zukan collection. I've been busy　for a while , so was not able to write in it here. However, meanwhile, I continued collecting various Oshawott goods and looked at here happily all the time. My English is poor as ever, I'm sorry(o_0;), but there are some questions. around Aulani Disney resort of Hawaii? Could you please tell me about it if there are the people who went to Hawaii recently. 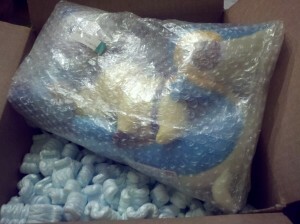 Next,　I want the giant Oshawott plush that appearing in The following photographs very><, is this available in Hawaii? If this is not selling in hawaii, is there the method that a Japanese resident buys this for? I want to know the price, too. I'm shipping internationally now, I've lowered a bunch of prices, and I added a bunch more things : ) Check it out!